Me: "What are you looking at in Saveur?" She, pointing to a photo: "This is what I want for dinner." Me, looking at the photo: "You want Latkes? 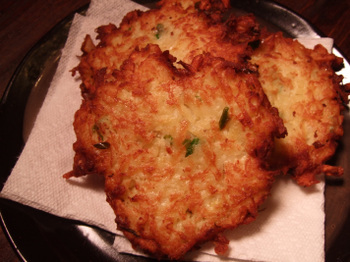 I've never made Latkes, I don't even know if I'm genetically predisposed to making Latkes." She, coming up with the pat response: "Don't worry, you can cook, it's easy......" Pointing to photo: "See, it's just a pancake. YOU CAN MAKE A PANCAKE, CAN'T YOU?" Me, suddenly realizing that I've been both complimented and called out at the same time: "humph...."
She: "Hey, you can do a post on it...."
Me: "I'm not sure, you realize that many family's treasure their recipes for Latkes, and I don't want to insult anyone...."
By this time, She had lost interest and left the room.....probably moved on to bigger and better things. It's a good thing that I've down sized my magazine subscriptions, and only receive a few publications, though I shudder to think what She may come up with in Sports Illustrated! Come to think of it, I think I'd better put my cookbooks under lock and key. As noted, this has been modified from the recipe in the December 2007 issue of Saveur. One key change was the substitution of green onions(scallions) for chives, which looked positively terrible at the market. 1 - Over a bowl, using the large-hole side of a box grater, alternate grating onion and potatoes. 2 - Sprinkle salt over potato-onion mixture, and transfer to a colander set over a bowl. Let drain for 10 minutes. 3 - Squeeze out as much moisture as possible from mixture, allowing the liquid to drain into the bowl. Set liquid side to let the starch in the liquid settle. 4 - Place mixture into another bowl, cover, and set aside. 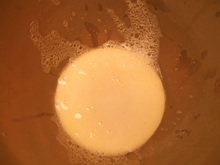 5 - After 5 minutes, pour off the liquid, leaving settled starch behind. 6 - Mix starch into the onion-potato mixture, along with green onions, matzo meal, eggs, salt, and pepper. 7 - Heat canola oil in a pan to the height of about 1/4" over medium heat. 8 - Form mixture into balls, using about 1/4-1/3 cup of the mixture for each ball. Place ball into oil, and flatten with a spatula. 9 - Fry until cooked, turning once, for about 5-8 minutes. 10 - Latkes are traditionally served with sour cream or apple sauce....but the Missus uses, gasp.....ketchup! 11 - Display your grated knuckles as a badge of courage! Postscript: Great minds must think alike (he-he-he), here's the one and only WanderingChopsticks, with her hunger inducing version. You just gave me a childhood flashback--when I used to help my mom grate the potatoes for the latkes, I always used to joke around that the potatoes were turning pink not from oxidation, but from my bleeding knuckles. Your latkes look quite gorgeous, actually, and I'm tickled to see you making one of my tribe's dishes--turn-about is fair game! :-) My mom would have been pleased that you hand-grated the potatoes--the texture of the finished latke is just not the same if you use the food processor, it mashes the potato up too much. Wow, just the fact that you have a subscription to Saveur has left me speechless. And then the wonderful Latkes you made with hand-grated potatoes. I kow tow to you, Sensei! So how did your Missus like it? And I probably would have used ketchup, too. What a coincidence! Well, not really since it was just Hanukkah...but I made latkes this week too! And *gasp* ate it with ketchup! :) And basically used the same recipe, minus the matzo meal since I didn't have any. Hmm. OK, I'm gonna go post my recipe so I can link to yours. Hehe. I tried this recipe a while back and enjoyed it (but not with ketchup!). I'm glad the missus was able to get you into the kitchen. ...use to eat my latkes with hoisin sauce, but that must just be the Asian in me! Oh--sooo yummy looking. I can feel my teeth biting through the delicate crunch! never tried latkes, but they look really good! I spit out my coffee when I read "Hey, you can do a post on it"...how many times have we heard THAT one??? Merry Christmas! Wow! Really beautiful. Never thought of using Yukon Gold potato. My grandmother used to use regular russet. Ketchup??!! Ye Gods! Sour cream or apple sauce, or a little sea salt. Now that's the way to eat a latke. That turned out looking pretty good. So necessity isn't the mother of invention; it's a wife who prods you into doing it. Merry Christmas to you and the Missus! Hi Carol - I think Saveur is the only food magazine I still subscribe to. The Missus loved them, but didn't realize how filling they were. Hi WC - I love your post.....ketchup and all! Hi Reid - Yep, out of restaurants, and back into the kitchen! Merry Christmas! Hi Kathy - Hoisin sauce? Now that's a new one. Hi Sher - Thanks! And Happy Holidays to you as well. Hi Kat - Really easy, but much more filling than I thought it would be. Hi Stephen - We both enjoyed the flavor of yukon golds, and it's a bit more starchy. Hi Elmo - Yes, you're right..... Merry Chritmas. ahah! Merry Christmas to you, the Missus and the Boys, Kirk. I love your wife's methods for getting the foods she likes to eat. YOU CAN MAKE A PANCAKE, CAN'T YOU?! seriously awesome, I'll have to remember that one for my arsenal when I get married. Hi Penny - Merry Christmas....the Missus has a huge "arsenal" and strategies....and most of them seem to work! Ouch, grated knuckles?! Reading that gave me the shivers, haha. The last time I've had latkes was in elementary school when we each brought in a food that represented our ethnic background. I liked it with sour cream rather than applesauce. Maybe I'll give ketchup a shot, it's potatoes anyways! Thanks for the holiday wishes! I hope you, the Missus, Sammy, and Frankie have a wonderful holiday season! Mmmm...I love Latkes! I made some during Hanukkah! My favorite way to eat them is with a dollop of applesauce and sour cream! Oh yum. I may have to make these again! Hi MJ - The Missus has really been enjoying hers as well! Happy New Year to you!